This fascinating collection of six interrelated poem sequences bound by one theme is a remarkable tour de force by one of the more challenging poets of our time. 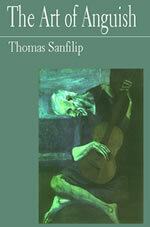 In this, The Art of Anguish, his third published collection of poetry, Thomas Sanfilip attempts to pierce our shabby web of appearances in order to find the unadulterated human experience; to probe, sometimes even to erase the distinctions between theory and action, reality and illusion, life and death, exposing the excruciating limits of oneness with the world, and the clash of our physical, biologic, mental, subtle, and causal aspects of being with nature itself. Yet what Sanfilip reveals more than anything else in these poem is the mystery he believes lies at the very root of all true self-realization; that in order to realize true reverence for life, mystery must be seen as its legitimate source; and that in humility before the unknown, one is finally liberated from all that would deter us from contact with the true self. The Art of Anguish is a work of brief yet gut-wrenching poetry that profoundly reacts to multiple aspects of being in a complex world ruled by forces beyond human comprehension. Inspirational in its stark look at the harsh demands of reality. Lovers of literature and the poetic arts will discover much to sink their minds into in Sanfilip’s challenging and impressive collection of poems, in a work whose parts are actually contained within an interesting whole, delivering an arresting dose of reality and anguish. Appreciatives of the form will be challenged to embrace the naked willingness required to realize the full potential of these meticulously crafted poems. For the very brave, The Art of Anguish extends an unusually superb reward.